I’m an avid reader. I can devour a book easily in a weekend or less, and of course this happens either because I have free time that weekend and/or the book is just too good to put down. I will admit that I try to pace myself now. A really good book is like dessert, I try to savor it, enjoy it, and take my time. But if I didn’t, and it was that good and I devoured it, I’ll read it again. It makes me think of a cruise I was on several years ago. The first night at dinner, they offered us Chocolate Lava Cake. It was delicious, a miniature cake filled with hot chocolate. The next night, they offered it again, and I ordered it again. I had it every night for four nights. When the final night of the cruise came, they had something special for us, Baked Alaska. I was disappointed, it was our last night, and I wanted the Chocolate Lava Cake. Well on a cruise, you can have just about anything you want and our waiter had the foresight to make sure that I also had Chocolate Lava Cake. It was delicious. I savored every morsel, taking the tiniest bites. That is how a great book is for me. I know the story, I know what to expect, and even though I’m prepared and I know how the story ends, I savor every word. 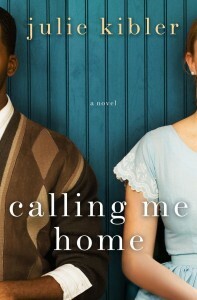 My book club will be discussing Calling Me Home by Julie Kibler tonight. I’m so excited because Julie will be joining us via Skype. Calling Me Home was the She Reads book of the month for February. It has also been optioned by Hollywood. We’re really interested to see whom Hollywood casts. Are there any books that you’ve read more than once?